ATLANTA, Ga. — Volvo Trucks couldn’t have picked a better year to unveil its new VNL series. That’s the message it delivered at the inaugural North American Commercial Vehicle (NACV) this week in Atlanta, Ga. The company, which just unveiled its new VNL series in July, said business this year has been great and it predicts that the long haul, regional, and construction industries will continue to improve in the future. 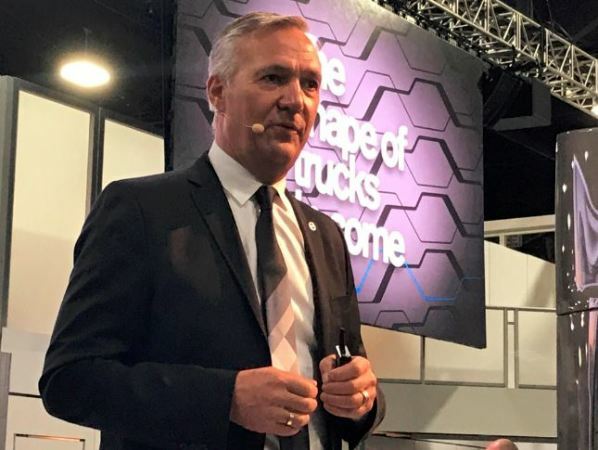 Volvo Trucks’ president, Nyberg took the opportunity at the truck show to give trucking journalists a business update and explain what is in the pipeline for Volvo in the near future. Diesel prices, he noted, have stayed on a good level and predicts that prices will only see a slight uptick in the future. Nyberg addressed that from 2016-2017, it saw a 5% drop in the long-haul segment. “That of course has been a bit painful for Volvo Trucks but the forecast looks pretty good, and the highway business is coming back stronger,” he said. He also predicted that natural gas trucks truck sales will be stagnant. “We always talk about natural gas, but as you have seen with fuel prices, natural gas has gone sideways and I expect it to continue that way,” he said. Nyberg added that to date, Volvo Trucks has reached its all-time high take rate of iShift and Volvo Power – 95% and 90% respectively.